With a stay at Holiday Village Kuukiuru in Vuostimo, you'll be 10.1 mi (16.2 km) from Pelkosenniemi Church and 11 mi (17.7 km) from Pyha-Luosto Visitor and Culture Centre Naava. Featured amenities include express check-in, multilingual staff, and laundry facilities. For a surcharge, guests may use a roundtrip airport shuttle (available 24 hours) and a train station pick-up service. Sokos Hotel Lakeus is in the heart of Seinajoki, walking distance from Epstori Shopping Center and Lakeuden Risti Tower. 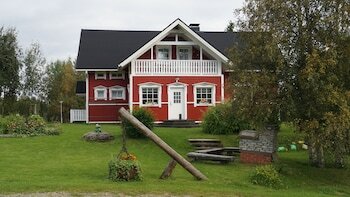 Summer Hotel Vuorilinna offers accommodations throughout the area in Savonlinna. Free self parking is available onsite. When you stay at Vierumäki Villa Sandy in Heinola, you'll be next to a golf course and 12 minutes by foot from Vierumaki Golf Club. Free self parking is available onsite. Located in Naantali, Kultaranta Resort is by the sea, within a 15-minute drive of Kultaranta and Moominworld. Free self parking is available onsite.